The Bronx Council for Environmental Quality will hold its annual membership meeting and water conference — Going from Step 2 to Designating a Brownfield Opportunity Area: Should BCEQ Harlem River BOA Step 2 project apply?” – on Wednesday, March 18, 2015 from 3 p.m. to 7 p.m. at Manhattan College, Leo Engineering Building at 3825 Corlear Avenue at 238th Street, Bronx NY. 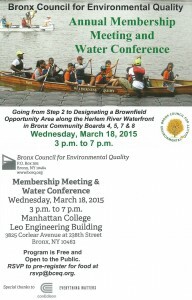 The Bronx Council for Environmental Quality (BCEQ) has been working since 2006 on revitalizing and restoring the area along the Harlem River from Sputyen Duyvil to 161st Street — later expanded to 149th Street in Step 2 in 2012. Just recently, it was announced that our Brownfield Opportunity Area (BOA) Project while completing the Step 2 process can apply to designate the complete catchment area as a “Brownfield Opportunity Area.” There is much work to do if we decide to do this. In addition to presenting our Step 2 work to nominate Strategic Sites/Areas within the targeted area, we are adding a discussion about the new “designation,” the benefits of the designation of an overall “Brownfield Opportunity Area” and whether or not we should apply. The first part of the program is a description of potential development anticipated for specific sites or areas and a request to community stakeholders to actively affirm commitments to the previously developed goals, objectives and vision statements shaped in relation to redevelopment and revitalization – both long and short term. BCEQ is proposing to nominate Strategic Sites within the area along the Harlem River waterfront in Bronx Community Boards 4, 5, 7 and 8, from 149th Street to Spuyten Duyvil. The second part is a discussion of designating a Brownfield Opportunity Area. The purpose of such designation is to facilitate the realization of the vision and goals laid out in the BOA Plan, to return brownfield sites to productive use and restore environmental quality. By requesting designation of a BOA, a municipality or community based organization affirms that it is committed to the revitalization of the area impacted by brownfields. The Secretary of State, by designating a BOA, confirms that the BOA Plan is consistent with the applicable provisions of Article 18-C, Section 970-r, of the General Municipal Law. The Program is free and open to the public. Special thanks to Con Edison for their support and the refreshments for this conference. RSVP to pre-register for food at rsvp@bceq.org.